Gilbert Keith Chesterton, KC*SG (29 May 1874 – 14 June 1936), was an English writer, poet, philosopher, dramatist, journalist, orator, lay theologian, biographer, and literary and art critic. Chesterton is often referred to as the "prince of paradox". Time magazine has observed of his writing style: "Whenever possible Chesterton made his points with popular sayings, proverbs, allegories—first carefully turning them inside out." Chesterton is well known for his fictional priest-detective Father Brown, and for his reasoned apologetics. Even some of those who disagree with him have recognised the wide appeal of such works as Orthodoxy and The Everlasting Man. Chesterton routinely referred to himself as an "orthodox" Christian, and came to identify this position more and more with Catholicism, eventually converting to Catholicism from High Church Anglicanism. George Bernard Shaw, his "friendly enemy", said of him, "He was a man of colossal genius." Biographers have identified him as a successor to such Victorian authors as Matthew Arnold, Thomas Carlyle, Cardinal John Henry Newman, and John Ruskin. Chesterton was born in Campden Hill in Kensington, London, the son of Marie Louise, née Grosjean, and Edward Chesterton. He was baptised at the age of one month into the Church of England, though his family themselves were irregularly practising Unitarians. According to his autobiography, as a young man Chesterton became fascinated with the occult and, along with his brother Cecil, experimented with Ouija boards. Chesterton was educated at St Paul's School, then attended the Slade School of Art to become an illustrator. The Slade is a department of University College London, where Chesterton also took classes in literature, but did not complete a degree in either subject. Chesterton married Frances Blogg in 1901; the marriage lasted the rest of his life. Chesterton credited Frances with leading him back to Anglicanism, though he later considered Anglicanism to be a "pale imitation". He entered full communion with the Catholic Church in 1922. In September 1895 Chesterton began working for the London publisher Redway, where he remained for just over a year. In October 1896 he moved to the publishing house T. Fisher Unwin, where he remained until 1902. During this period he also undertook his first journalistic work, as a freelance art and literary critic. In 1902 the Daily News gave him a weekly opinion column, followed in 1905 by a weekly column in The Illustrated London News, for which he continued to write for the next thirty years. Early on Chesterton showed a great interest in and talent for art. He had planned to become an artist, and his writing shows a vision that clothed abstract ideas in concrete and memorable images. Even his fiction contained carefully concealed parables. Father Brown is perpetually correcting the incorrect vision of the bewildered folks at the scene of the crime and wandering off at the end with the criminal to exercise his priestly role of recognition and repentance. For example, in the story "The Flying Stars", Father Brown entreats the character Flambeau to give up his life of crime: "There is still youth and honour and humour in you; don't fancy they will last in that trade. Men may keep a sort of level of good, but no man has ever been able to keep on one level of evil. That road goes down and down. The kind man drinks and turns cruel; the frank man kills and lies about it. Many a man I've known started like you to be an honest outlaw, a merry robber of the rich, and ended stamped into slime." Chesterton was a large man, standing 6 feet 4 inches (1.93 m) and weighing around 20 stone 6 pounds (130 kg; 286 lb). His girth gave rise to a famous anecdote. During the First World War a lady in London asked why he was not "out at the Front"; he replied, "If you go round to the side, you will see that I am." On another occasion he remarked to his friend George Bernard Shaw, "To look at you, anyone would think a famine had struck England." Shaw retorted, "To look at you, anyone would think you had caused it." P. G. Wodehouse once described a very loud crash as "a sound like G. K. Chesterton falling onto a sheet of tin". Near the end of Chesterton's life, Pope Pius XI invested him as Knight Commander with Star of the Papal Order of St. Gregory the Great (KC*SG). The Chesterton Society has proposed that he be beatified. He is remembered liturgically on 13 June by the Episcopal Church, with a provisional feast day as adopted at the 2009 General Convention. Chesterton wrote around 80 books, several hundred poems, some 200 short stories, 4000 essays, and several plays. He was a literary and social critic, historian, playwright, novelist, Catholic theologian and apologist, debater, and mystery writer. He was a columnist for the Daily News, The Illustrated London News, and his own paper, G. K.'s Weekly; he also wrote articles for the Encyclopædia Britannica, including the entry on Charles Dickens and part of the entry on Humour in the 14th edition (1929). His best-known character is the priest-detective Father Brown, who appeared only in short stories, while The Man Who Was Thursday is arguably his best-known novel. He was a convinced Christian long before he was received into the Catholic Church, and Christian themes and symbolism appear in much of his writing. In the United States, his writings on distributism were popularised through The American Review, published by Seward Collins in New York. Of his nonfiction, Charles Dickens: A Critical Study (1906) has received some of the broadest-based praise. According to Ian Ker (The Catholic Revival in English Literature, 1845–1961, 2003), "In Chesterton's eyes Dickens belongs to Merry, not Puritan, England"; Ker treats Chesterton's thought in Chapter 4 of that book as largely growing out of his true appreciation of Dickens, a somewhat shop-soiled property in the view of other literary opinions of the time. Self-portrait of Chesterton based on the distributist slogan "Three acres and a cow"
Shaw represented the new school of thought, modernism, which was rising at the time. Chesterton's views, on the other hand, became increasingly more focused towards the Church. In Orthodoxy he writes: "The worship of will is the negation of will … If Mr. Bernard Shaw comes up to me and says, 'Will something', that is tantamount to saying, 'I do not mind what you will', and that is tantamount to saying, 'I have no will in the matter.' You cannot admire will in general, because the essence of will is that it is particular." The wild worship of lawlessness and the materialist worship of law end in the same void. Nietzsche scales staggering mountains, but he turns up ultimately in Tibet. He sits down beside Tolstoy in the land of nothing and Nirvana. They are both helpless – one because he must not grasp anything, and the other because he must not let go of anything. The Tolstoyan's will is frozen by a Buddhist instinct that all special actions are evil. But the Nietzscheite's will is quite equally frozen by his view that all special actions are good; for if all special actions are good, none of them are special. They stand at the crossroads, and one hates all the roads and the other likes all the roads. The result is – well, some things are not hard to calculate. They stand at the cross-roads. Chesterton, as a political thinker, cast aspersions on both progressivism and conservatism, saying, "The whole modern world has divided itself into Conservatives and Progressives. The business of Progressives is to go on making mistakes. The business of the Conservatives is to prevent the mistakes from being corrected." He was an early member of the Fabian Society, but resigned from it at the time of the Boer War. Another contemporary and friend from schooldays was Edmund Bentley, inventor of the clerihew. Chesterton himself wrote clerihews and illustrated his friend's first published collection of poetry, Biography for Beginners (1905), which popularised the clerihew form. Chesterton was also godfather to Bentley's son, Nicolas, and opened his novel The Man Who Was Thursday with a poem written to Bentley. Chesterton faced accusations of anti-Semitism during his lifetime, as well as posthumously. An early supporter of Captain Dreyfus, by 1906 he had turned into an anti-dreyfusard. From the early 20th century, his fictional work included caricatures of Jews, stereotyping them as greedy, cowardly, disloyal and communists. The most virulent attacks in the Marconi affair were launched by Hilaire Belloc and the brothers Cecil and G. K. Chesterton, whose hostility to Jews was linked to their opposition to liberalism, their backward-looking Catholicism, and their nostalgia for a medieval Catholic Europe that they imagined was ordered, harmonious, and homogeneous. The Jew baiting at the time of the Boer War and the Marconi scandal was linked to a broader protest, mounted in the main by the Radical wing of the Liberal Party, against the growing visibility of successful businessmen in national life and their challenge to what were seen as traditional English values. Historian Frances Donaldson says, "If Belloc's feeling against the Jews was instinctive and under some control, Chesterton's was open and vicious, and he shared with Belloc the peculiarity that the Jews were never far from his thoughts." In The New Jerusalem, Chesterton made it clear that he believed that there was a "Jewish Problem" in Europe, in the sense that he believed that Jewish culture (though not Jewish ethnicity) separated itself from the nationalities of Europe. [not in citation given] He argued that he was quite in favour of a Jew becoming Prime Minister or Lord Chancellor, under the condition, though, that "every Jew must be dressed like an Arab […] The point applies to any Jew, and to our own recovery of healthier relations with him. The point is that we should know where we are; and he would know where he is, which is in a foreign land." He suggested the formation of a Jewish homeland as a solution, and was later invited to Palestine by Jewish Zionists who saw him as an ally in their cause. Later he grew out of the notion of Palestine as a Jewish homeland, and suggested somewhere in Africa instead. When Hitlerism came, he was one of the first to speak out with all the directness and frankness of a great and unabashed spirit. Blessing to his memory! In The Truth about the Tribes Chesterton blasted German race theories, writing: "the essence of Nazi Nationalism is to preserve the purity of a race in a continent where all races are impure." The historian Simon Mayers points out that Chesterton wrote in works such as The Crank, The Heresy of Race, and The Barbarian as Bore against the concept of racial superiority and critiqued pseudo-scientific race theories, saying they were akin to a new religion. In The Truth About the Tribes Chesterton wrote, "the curse of race religion is that it makes each separate man the sacred image which he worships. His own bones are the sacred relics; his own blood is the blood of St. Januarius." Mayers records that despite "his hostility towards Nazi antisemitism … [it is unfortunate that he made] claims that 'Hitlerism' was a form of Judaism, and that the Jews were partly responsible for race theory." In The Judaism of Hitler Chesterton wrote "Hitlerism is almost entirely of Jewish origin." In A Queer Choice Chesterton maintained that the only possible source of "the Hitlerites" idea of "a Chosen Race" was "from the Jews." In The Crank Chesterton went on to say: "If there is one outstanding quality in Hitlerism it is its Hebraism" and "the new Nordic Man has all the worst faults of the worst Jews: jealousy, greed, the mania of conspiracy, and above all, the belief in a Chosen Race." Mayers also shows that Chesterton didn't just portray Jews as culturally and religiously distinct, but racially as well. Chesterton wrote The Feud of the Foreigner in 1920, saying that the Jew "is a foreigner far more remote from us than is a Bavarian from a Frenchman; he is divided by the same type of division as that between us and a Chinaman or a Hindoo. He not only is not, but never was, of the same race." In The Everlasting Man, while writing about human sacrifice, Chesterton suggested that medieval stories about Jews killing children might have resulted from a distortion of genuine cases of devil-worship. 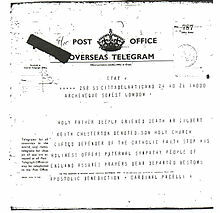 Chesterton wrote: "the Hebrew prophets were perpetually protesting against the Hebrew race relapsing into an idolatry that involved such a war upon children; and it is probable enough that this abominable apostasy from the God of Israel has occasionally appeared in Israel since, in the form of what is called ritual murder; not of course by any representative of the religion of Judaism, but by individual and irresponsible diabolists who did happen to be Jews." Chesterton goes on in the paragraph to speak of "the enormous [devotional] popularity of the Child Martyr of the Middle Ages" and of little St. Hugh (figures held to have been ritual victims of Jews). The American Chesterton Society has devoted a whole issue of its magazine, Gilbert, to defending Chesterton against charges of antisemitism. In Eugenics and Other Evils Chesterton attacked eugenics as Britain was moving towards passage of the Mental Deficiency Act 1913. Some backing the ideas of eugenics called for the government to sterilise people deemed "mentally defective"; this view did not gain popularity but the idea of segregating them from the rest of society and thereby preventing them from reproducing did gain traction. These ideas disgusted Chesterton who wrote, "It is not only openly said, it is eagerly urged that the aim of the measure is to prevent any person whom these propagandists do not happen to think intelligent from having any wife or children." He blasted the proposed wording for such measures as being so vague as to apply to anyone, including "Every tramp who is sulk, every labourer who is shy, every rustic who is eccentric, can quite easily be brought under such conditions as were designed for homicidal maniacs. That is the situation; and that is the point … we are already under the Eugenist State; and nothing remains to us but rebellion." He derided such ideas as founded on nonsense, "as if one had a right to dragoon and enslave one's fellow citizens as a kind of chemical experiment". Chesterton also mocked the idea that poverty was a result of bad breeding: "[it is a] strange new disposition to regard the poor as a race; as if they were a colony of Japs or Chinese coolies … The poor are not a race or even a type. It is senseless to talk about breeding them; for they are not a breed. They are, in cold fact, what Dickens describes: 'a dustbin of individual accidents,' of damaged dignity, and often of damaged gentility." Chesterton is often associated with his close friend, the poet and essayist Hilaire Belloc. George Bernard Shaw coined the name "Chesterbelloc" for their partnership, and this stuck. Though they were very different men, they shared many beliefs; Chesterton eventually joined Belloc in the Catholic faith, and both voiced criticisms of capitalism and socialism. They instead espoused a third way: distributism. G. K.'s Weekly, which occupied much of Chesterton's energy in the last 15 years of his life, was the successor to Belloc's New Witness, taken over from Cecil Chesterton, Gilbert's brother, who died in World War I.
Chesterton's The Everlasting Man contributed to C. S. Lewis's conversion to Christianity. In a letter to Sheldon Vanauken (14 December 1950)[page needed] Lewis calls the book "the best popular apologetic I know", and to Rhonda Bodle he wrote (31 December 1947) "the [very] best popular defence of the full Christian position I know is G. K. Chesterton's The Everlasting Man". The book was also cited in a list of 10 books that "most shaped his vocational attitude and philosophy of life". Chesterton's novel The Man Who Was Thursday inspired the Irish Republican leader Michael Collins with the idea: "If you didn't seem to be hiding nobody hunted you out." Collins's favourite work of Chesterton was The Napoleon of Notting Hill, and he was "almost fanatically attached to it", according to his friend Sir William Darling who cemented their friendship in their shared appreciation of Chesterton's work. Etienne Gilson praised Chesterton's Aquinas volume as follows: "I consider it as being, without possible comparison, the best book ever written on Saint Thomas … the few readers who have spent twenty or thirty years in studying St. Thomas Aquinas, and who, perhaps, have themselves published two or three volumes on the subject, cannot fail to perceive that the so-called 'wit' of Chesterton has put their scholarship to shame." Archbishop Fulton J. Sheen, author of seventy books, identified Chesterton as the stylist who had the greatest impact on his own writing, stating in his autobiography Treasure in Clay, "the greatest influence in writing was G. K. Chesterton who never used a useless word, who saw the value of a paradox, and avoided what was trite." Chesterton wrote the introduction for Sheen's book God and Intelligence in Modern Philosophy; A Critical Study in the Light of the Philosophy of Saint Thomas. Canadian media theorist Marshall McLuhan was heavily influenced by Chesterton; McLuhan said the book What's Wrong with the World changed his life in terms of ideas and religion. In the Fall of 2014, a Catholic high school, G.K. Chesterton Academy of Chicago, opened in Highland Park, Illinois, a suburb of Chicago. A fictionalised GK Chesterton is the central character in the Young Chesterton Chronicles, a series of young adult adventure novels written by John McNichol, and published by Sophia Institute Press and Bezalel Books. A fictionalised GK Chesterton is the central character in the G K Chesterton Mystery series, a series of detective novels written by Australian Kel Richards, and published by Riveroak Publishing. Chesterton wrote the hymn O God of Earth and Altar which was printed in The Commonwealth and then included in the English Hymnal in 1906. Several lines of the hymn are sung in the beginning of the song Revelations by the British heavy metal band Iron Maiden on their 1983 album Piece of Mind. Lead singer Bruce Dickinson in an interview stated "I have a fondness for hymns. I love some of the ritual, the beautiful words, Jerusalem and there was another one, with words by G.K. Chesterton O God of Earth and Altar – very fire and brimstone: 'Bow down and hear our cry'. I used that for an Iron Maiden song, Revelations. In my strange and clumsy way I was trying to say look it's all the same stuff." Chesterton, Gilbert Keith (1904), Ward, M (ed. ), The Napoleon of Notting Hill, UK: DMU . ——— (1911b), Ward, M (ed. ), The Ballad of the White Horse, UK: DMU . ——— (1920), Ward, M (ed. ), The New Jerusalem, UK: DMU . ——— (1950), Ward, M (ed. ), The Common Man, UK: DMU . "The Modern Surrender of Women," The Dublin Review, Vol. CXLV, No. 290-291, July/October 1909. "What is Toleration?," The Dublin Review, Vol. CXLVII, No. 294-295, July/October 1910. "An Agnostic Defeat," The Dublin Review, Vol. CL, No. 300-301, January/April 1912. "What is a Conservative?," The Dublin Review, Vol. CL, No. 300-301, January/April 1912. "The Absence of Mr. Glass," McClure's Magazine, November 1912. "The Strange Crime of John Boulnois," McClure's Magazine, February 1913. "The Paradise of Thieves," McClure's Magazine, March 1913. "The Man in the Passage," McClure's Magazine, April 1913. "The Purple Wig," McClure's Magazine, July 1913. "The Head of Caesar," McClure's Magazine, August 1913. "Magic," The Dublin Review, Vol. CLIV, No. 308-309, January/April 1914. "Wilfrid Ward," The Dublin Review, Vol. CLIX, No. 314-315, July/October 1916. "The Plan for a New War," The North American Review, Vol. 206, No. 745, Dec. 1917. "Germany and Alsace-Lorraine: How to Help Annexation," The North American Review, Vol. 207, No. 748, Mar. 1918. "The Real Secret Diplomacy," The North American Review, Vol. 207, No. 749, Apr. 1918. "A Note on the New Martyrdom," The Lotus Magazine, Vol. 10, No. 2, Feb. 1919. "The Doom of the Darnaways," The North American Review, Vol. 228, No. 4, Oct. 1929. "The Inefficiency of Science," The North American Review, Vol. 228, No. 5, Nov. 1929. "The Mission of Ireland," Studies: An Irish Quarterly Review, Vol. 21, No. 83, Sep. 1932. "The Crime of the Communist," Collier's Weekly, July 1934. "The Three Horsemen," Collier's Weekly, April 1935. "The Ring of the Lovers," Collier's Weekly, April 1935. "A Tall Story," Collier's Weekly, April 1935. ^ a b O'Connor, John (1937). Father Brown on Chesterton (PDF). Frederick Muller Ltd.
^ Ker 2011, p. 485. ^ Simkin, John. "G. K. Chesterton". Spartacus Educational. ^ Ker 2011, p. 1. ^ Ker 2011, p. 13. ^ "GK Chesterton's Conversion Story", Socrates 58 (World Wide Web log), March 2007 . ^ a b Ker 2011, p. 41. ^ "G.K. Chesterton January, 1915". Clarence Darrow digital collection. University of Minnesota Law School. Archived from the original on 21 May 2014. Retrieved 21 May 2014. ^ Cornelius, Judson K. Literary Humour. Mumbai: St Paul's Books. p. 144. ISBN 978-81-7108-374-9. ^ a b "Gilbert Keith Chesterton (1874–1936)". Catholic Authors. ^ Antonio, Gaspari (14 July 2009). "'Blessed' G. K. Chesterton? : Interview on Possible Beatification of English Author". Zenit: The World Seen from Rome. Rome. Archived from the original on 15 June 2010. Retrieved 18 October 2010. ^ Kiefer, James. "G. K. Chesterton". The Lectionary. Charles Wohlers. ^ "The Blunders of Our Parties", Illustrated London News, 19 April 1924 . ^ Holroyd, Michael (1989). Bernard Shaw Vol 2. London: Chatto & Windus. p. 214. ISBN 978-0701133504. ^ a b c d e f g h i Simon Mayers (2013). 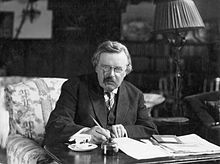 Chesterton's Jews: Stereotypes and Caricatures in the Literature and Journalism of G.K. Chesterton. pp. 85–87. ISBN 9781490392462. ^ a b Frances Donaldson (2011). The Marconi Scandal. Bloomsbury Publishing. p. 51. ISBN 9781448205547. ^ Todd M. Endelman (2002). The Jews of Britain, 1656 to 2000. p. 155. ISBN 9780520227194. ^ Pearce, Joseph (2005). Literary Giants, Literary Catholics. San Francisco: Ignatius Press. p. 95. ISBN 978-1-58617-077-6. ^ Ward 1944, p. 265. ^ Shaw, George Bernard (1918). "Belloc and Chesterton," The New Age, South Africa Vol. II, No. 16, pp. 309–311. ^ McInerny, Ralph. "The Chesterbelloc Thing" Archived 29 December 2012 at the Wayback Machine, The Catholic Thing, 30 September 2008. ^ Wells, H. G. (1908). "About Chesterton and Belloc," The New Age, South Africa Vol. II, No. 11, pp. 209–210 (Rep. in Social Forces in England and America, 1914). ^ Letter to Sheldon Vanauken, Archived 3 March 2013 at the Wayback Machine 14 December 1950. ^ Lewis, Clive Staples, The Collected Letters, 2, p. 823 . ^ Gilson, Etienne (1987), "Letter to Chesterton's editor", in Pieper, Josef (ed. ), Guide to Thomas Aquinas, University of Notre Dame Press, pp. 6–7 . ^ Rajmohan Gandhi (2007). Gandhi: The Man, His People, and the Empire. Los Angeles: University of California Press. pp. 139–141. ^ Furbank, PN (1974), "Chesterton the Edwardian", in Sullivan, John (ed. ), GK Chesterton: A Centenary Appraisal, Harper and Row . ^ "The American Chesterton Society". ^ "Chesterton", Gazetteer of Planetary Nomenclature, United States: Geological Survey, 17 September 2012 . ^ School built around G.K. Chesterton to open in Highland Park, United States Chicago: highlandpark suntimes, 19 March 2014, archived from the original on 25 May 2014, retrieved 25 May 2014 . ^ Richards, Kel (2002). Murder in the Mummy's Tomb: A G.K. Chesterton Mystery. ISBN 978-1589199637. ^ "Bruce Dickinson: Faith And Music (1999)" – via YouTube. Cooney, A (1999), G.K. Chesterton, One Sword at Least, London: Third Way, ISBN 978-0-9535077-1-9 . McLuhan, Marshall (1936), "GK Chesterton: A Practical Mystic", Dalhousie Review, 15 (4) . Oddie, William (2010). Chesterton and the Romance of Orthodoxy: The Making of GKC, 1874–1908. Oxford University Press. Orage, Alfred Richard. (1922). "G.K. Chesterton on Rome and Germany." In: Readers and Writers (1917–1921). London: George Allen & Unwin, pp. 155–161. Paine, Randall (1999), The Universe and Mr. Chesterton, Sherwood Sugden, ISBN 978-0-89385-511-6 . Sullivan, John (1974), G.K. Chesterton: A Centenary Appraisal, London: Paul Elek, ISBN 978-0-236-17628-1 . "Archival material relating to G. K. Chesterton". UK National Archives. What's Wrong: GKC in Periodicals Articles by G. K. Chesterton in periodicals, with critical annotations. The American Chesterton Society, retrieved 28 October 2010 .